Translucent folders to see contents. Sealed on two sides to prevent documents for falling out. Polypropylene is wear, tear, and moisture resistant.Tough and big, these side-loading envelopes boast sturdy gussets. Acid-free, archival quality envelopes are perfect for long term storage of important documents. 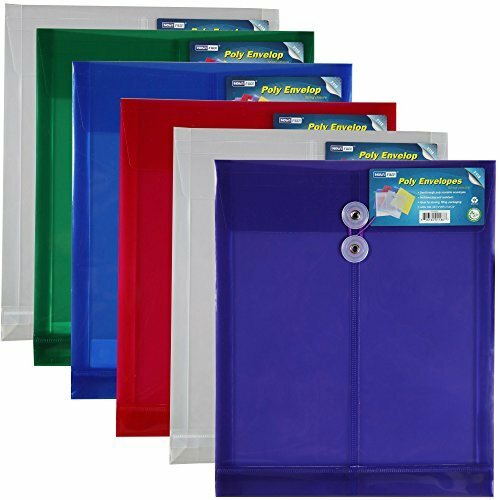 Heavy-duty polypropylene resists tears and repels moisture.Very durable folder enough for you to carry it with you anywhere while keeping everything intact. No more loose papers to worry about. Functional professional folder.Acid-free, archival quality envelopes are perfect for long term storage. Boast gussets that expand to handle growing projects. Durable poly zipper envelope is waterproof and tear-resistant with 1" expansion. Top loading. Letter size, assorted colors. Brand: Pendaflex | Manufacturer: TOPS Business Forms, Inc.
Zipper bag length is 9 inch/23cm, width is 4.7 inch/12cm, can hold A6 sized documents. 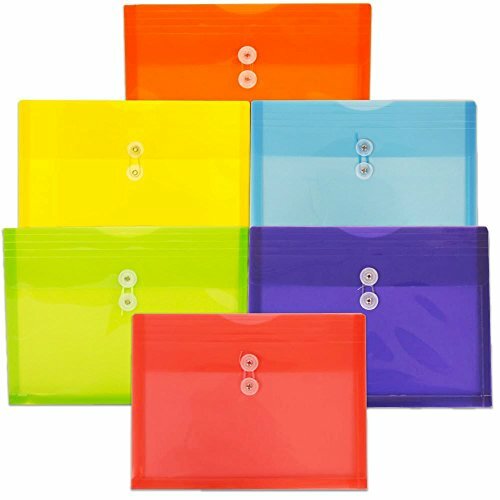 7-color zipper bag: Folders have 7 different colors, so you can classify documents according to the color, making documents more orderly. High-quality material: zipper bag made of PP, waterproof and moisture proof. Full transparent material, can read the inside contents, so you can check the information at a glance. Zipper is plastic, with good sealing. Zipper bags are widely used in office, study, travel and other occasions. Holding documents: can be stored notes, documents, cards, coupons, etc., can also store travel items, such as travel information, passports, tickets and so on. Various uses: Zipper bags can act as wallets, to hold small change and coins; can also be used as a pen bag, to storage pens, clips and other stationery. 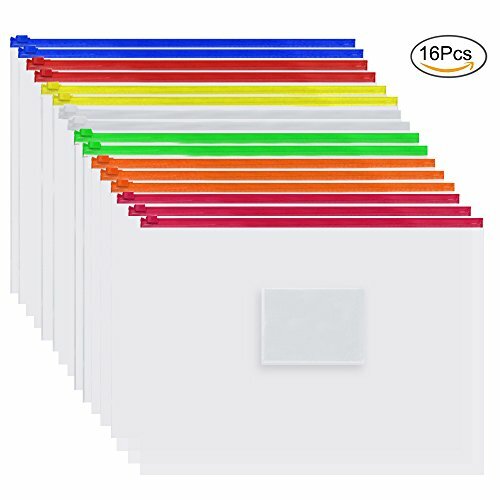 Multi-Color: Package contains 16 poly zip envelopes in 7 different colors to help you sort documents more orderly. Size: single zipper bag length is 9.4 inch/24 cm and width is 4.7 inch/12 cm, to hold A6 sized files. Material: Zipper bag made of PP, waterproof and moisture proof. Full transparent material, can read the inside contents, so you can check the information at a glance. Zipper is plastic, with good sealing. Storage assistant: zipper bag can be used to store bills, documents, cards, coupons and so on, also to store travel documents, such as travel information, passports, tickets and so on. 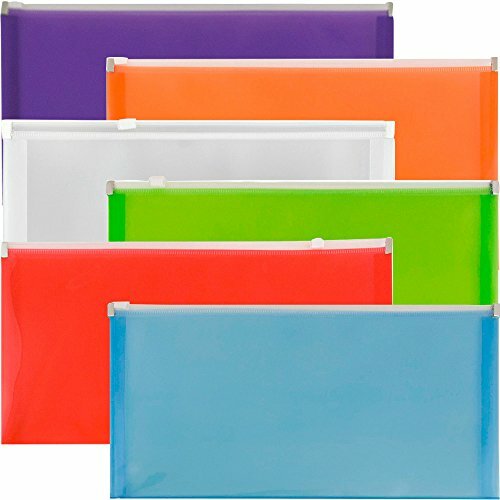 Pack of 6 mix color Envelopes 11.8 x 1.1 x 9.8 inches (1Green,1Blue,2Clear,1Purple,1Red). Made of durable poly, Tear and water Resistant. Professionally made to keep your important documents safe and secure. Expandable Gusset(1.25'' inch) for large capacity, can hold up to 200 standard sheets of paper. Ideal for reports and assignments. Made of thick and durable poly, Water and Tear Resistant, Professionally made with Vibrant colors! Our folder can store files in offices, schools, stores, and other places. 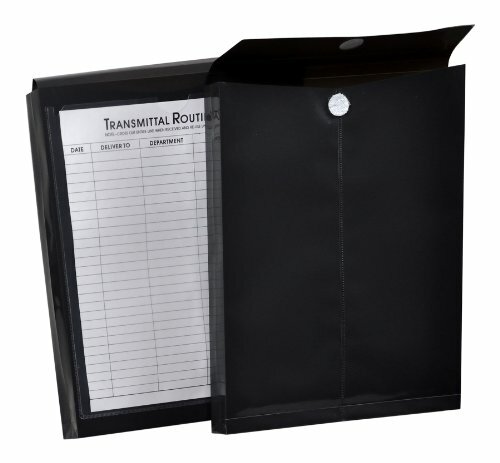 Our folder can also be used to organize personal items and documents. With a transparent surface, it's easy to distinguish between items when you need to find them again. Quality Assurance: Made of high-quality plastic, waterproof and moisture-proof; the surface of the folder is clear and bright, thick and durable, non-toxic and odorless, with professional quality assurance. Large capacity: each folder can store up to 150 sheets of A4 paper. Button closure design: with button design, it is easy and convenient to open the folder. The buttons are made of plastic and can be reused, not easy to break. 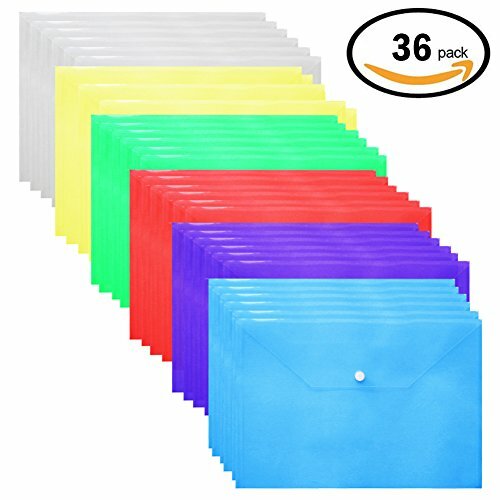 Package contains: 16 A4 size Poly Zip Envelopes in 7 colors - blue, red, yellow, white, green, orange, rose. 3 rose and 3 orange envelopes, 2 each for the other colors. Our zip envelope is made of high quality PVC material, the surface is smooth and transparent, wear resistant and durable, and it will bring you a good experience anytime and anywhere. Product size: A4 size, to meet the file storage in office working and learning. Product features: rich colors to meet your classification needs. The PVC surface effectively blocks moisture and protects documents from damage. Our folders are not only suitable for file storage in offices, schools, shops and other places, but also for collecting your personal belongings. With transparent surfaces, you can easily distinguish the items when you need them again. Poly envelopes are a great choice for conveniently storing documents whether on the desk, in the drawer or on the go. String tie closure for security and portability. 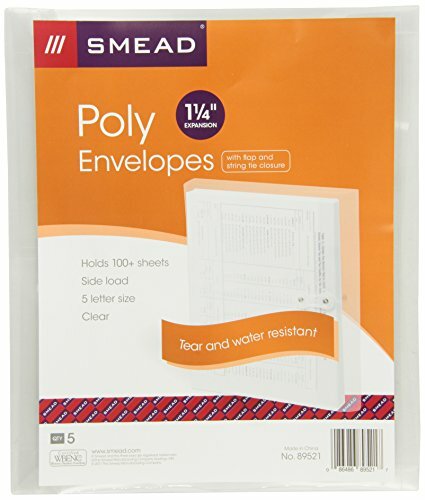 Durable poly material resists tears and repels moisture, making these envelopes ideal for the home, office or classroom. Side loading file envelopes expand to 1-1/4". Includes 5 side load letter size (9-3/4" W x 11-5/8" H) poly envelopes with protective flap and string tie closure. Acid free and PVC free. 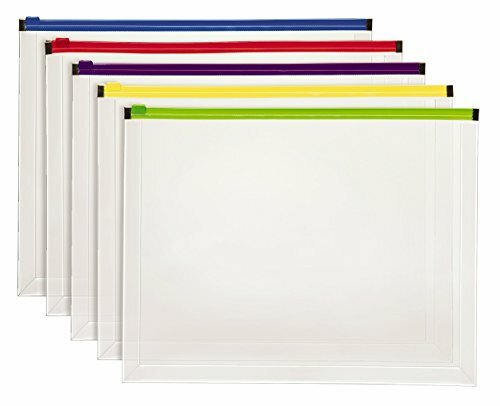 These expansion envelopes are perfect for securing, protecting, and storing documents at home, in school, or at the office! These zipper file bags are in 3 different sizes, A4(13.2 x 9.5 inch),B4(15.4 x 11 inch),A5(9.4 x 6.9 inch). 10 pieces zipper file bags paper document bag mesh documents pouches suitable for storing all kinds of documents organizes, personal cosmetics, small tool, travel accessories and more. Zipper file bags are made of PVC material, flexible, eco-friendly and non-toxic, durable, water resistant and oil resistant, can be keep your files secure. durable to use. 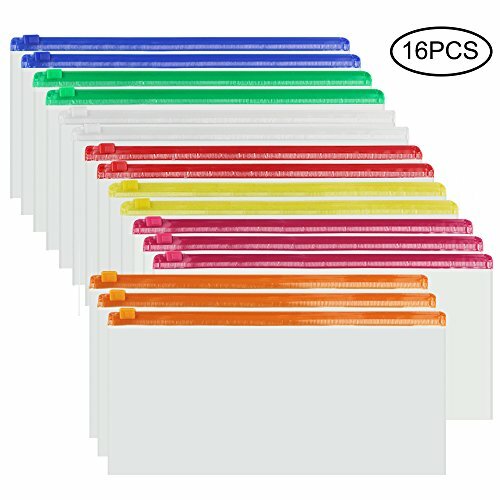 Assorted translucent colors choices help you to sort out documents accurately and efficiently. Mesh design can protect your privacy when you take the items out from your bag in public. Suitable for general office, travelling, school and home use. Note: please do not put all in water, cause the top material with nylon fabric and zipper. These poly documents folders with zipper smoothly, help to hold your goods safely and easy to put them in or take them out, convenient for using. 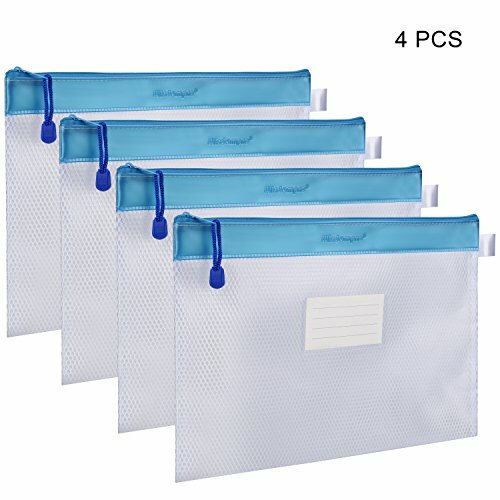 This set of paper document bags fit for different items, like project file, term papers, letters, business receipts, pens, smartphone, map, passport, children toys, cables, earphones, pill bottles, art kits, drug medication prescription, cash, cosmetics tool or travel accessories and more,Can keep these items safe in it. Standard Paper File Bags - Filing bag sized approx. 15.4 x 11 inches, suitable for the size of the B4 file. Can be safe and convenient storage Office Document, Term Papers, Newspapers, Business Receipts, Magazines, Memo, Art Kits, Drug Medication Prescription. Great portable file bag organizer at home,park,school,train travel and wherever you need! Multi-purpose Bags- Portable plastic file bag have a large storage space, able to store all project file,letters, pens, iPad, cellphones, map, passport, notebook, children toys, cables, earphones, pill bottles, cash, cosmetics tool or travel accessories and more. Also an be use a organizer storage packing bags, toiletries bags,and makeup tool pouch bag. 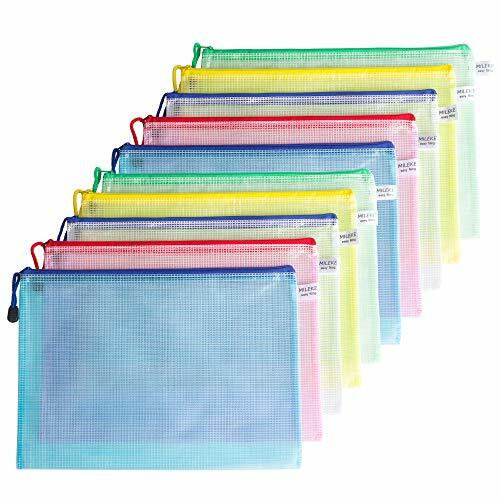 Eco-friendly Waterproof PP Material - The zipper mesh document folder is made of high quality PP Plastic, Washable Material Deters Dirt and Humidity. It also wear-resistant,tear-resistant and moisture-resistant,non-toxic, acid-free, archival quality envelopes are perfect for long-term storage of important documents. Note: please do not put all in water, cause the top material with nylon fabric and zipper. Mesh design can protect your privacy when you take the items out from your bag in public. 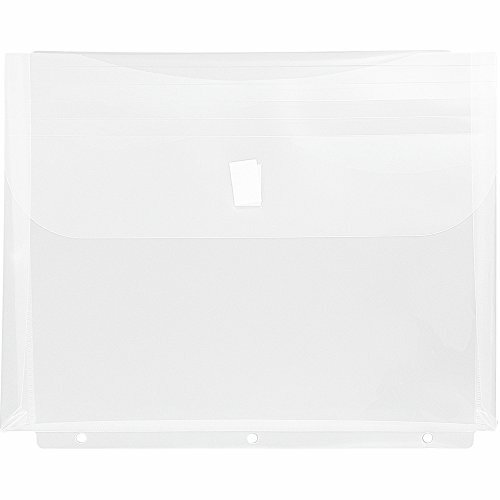 White Translucent and Hanging Design - Zipper file envelope, Translucent white document folder to make sure you classify the documents and keep good your collection and classification. Zipper with nylon strip for you to hang and carry out; One large opening,convenient to put in and take out. Ideal Gift - The poly document envelope are suitable for workers,doctors,teachers,students and so on. It can use them for all kinds of sorting papers and keeping them organized.No more clutter or frayed nerves trying to find something quickly. Best gift or award at good price for occasions as Graduation, Business Meeting, Promotional, PR, Festivals, Fairs, Thanksgiving Day, Christmas, New Year's Day, Employee Benefits and more. 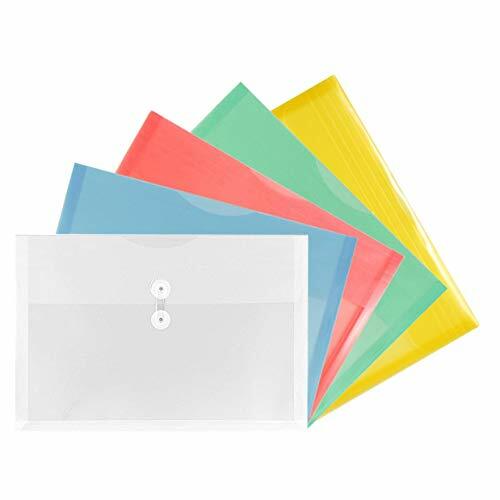 Plastic envelopes flexible, eco-friendly and non-toxic, durable, Very durable folder enough for you to carry it with you anywhere while keeping everything intact. No more loose papers to worry about. Keeping organized is tough,especially when you're that person whose desk is always cluttered. Yet with our Document holders, that are bright and stylish, all the while keeping your documents protected and intact, you'll turn into the most organized in the office! If you are looking for index size to fit your index cards or jumbo booklet size to fit your big presentations, LaOficina Poly Envelope Binder Pocket Folder will be your best choice. 1.Acid-free, archival quality polypropylene envelope won't damage your documents. 2.Fully reusable, it holds about 10 sheets paper. 3.Hook and Loop Closure design provide heavy weight thickness to prevent the paper from easily folding or creasing. Your support and satisfaction is our power to move ahead. If there is any question about the product of your order, please do not hesitate to let us know. Dimensions: Envelope Size: 315mm x 240mm / 12.4" x 9.4". Design for hook & loop closure, provide heavy weight thickness to prevent the paper from easily folding or creasing. Perfect for file client reports, legal papers, real estate contracts or other important documents in this expanding envelope. Satin-finished polypropylene material and front flap provide extra reassurance against creases and smudges. 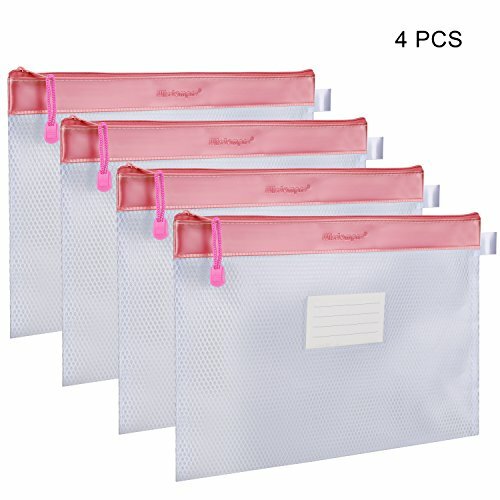 Wisdompro Letter Size Zipper File Bags are the perfect choice to keep your Documents,Papers,Notebook,Cosmetics, Phone and other items well organized. Made of premiun PVC material,durable and soft Zipper closure to keep your credentials from falling out, and dust, dirt and moisture from getting inside. Special dedesin with a Outer Label Pocket Organizer helps you to classify and identify your documents. Dimensions: 13.3" x 9.8"(34cm x 25cm) Wisdompro Customer Satisfaction Warranty: If you encounter issues with any Wisdompro product, please do not hesitate to contact us, we will be happy to help you solve it. Zipper with Nylon Strip for Hanging as well as to Protect Your Valuable Credentials from Outer Elements like Dust, Oils etc. Outer Label Pocket Organizer Help You to Classify and Identify Your Objects. Zipper Bags Size About: 13.3 x 9.8(34cm x 25cm). Large Enough to Hold Letter Size Papers and Other Similar Size Items. Size: #10 (5 x 1.25 x 10 inches) | Great for storing receipts, coupons, bank slips, folded documents, pens, and more! 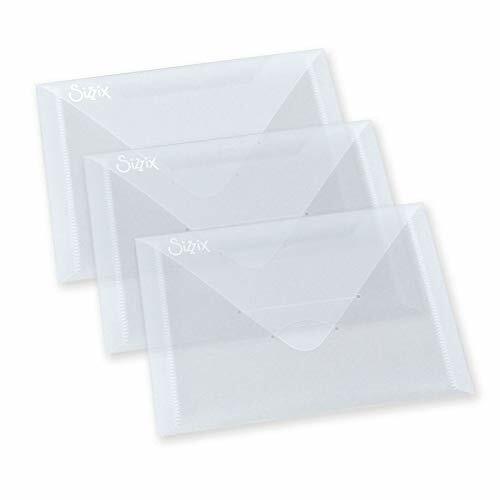 SIZZIX-Plastic Envelopes. These stylish plastic envelopes are the perfect solution for organizing and safely storing loose dies embossing folders cling stamps and other assorted crafting supplies. They measures 5x6-7/8 Inch and have a plastic snap closure. Each package contains three plastic envelopes. Imported. Stylish, plastic envelopes are the perfect solution for organizing and safely storing loose Framelits or Thinlits Dies or Textured Impressions, Texture Fades or Texture Trades Embossing Folders as well as your favourite cling stamps. Available in a pack of three, these handy envelopes can be easily labelled for a truly customized look. These document holders are perfect for staying organized at the office, at school, or on the go! 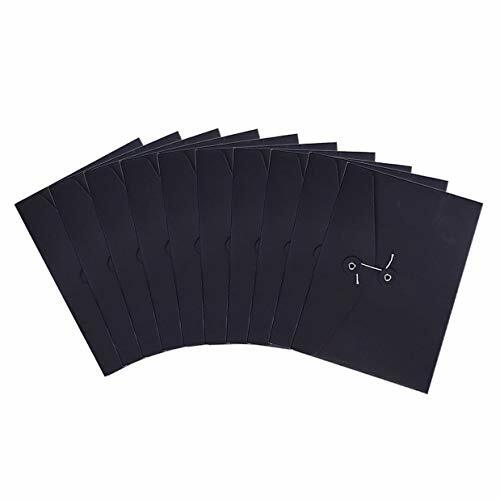 Plastic Envelopes Folders AN OFFICE NECESSITY : Ideal For Securely Carrying Plenty of Important Documents in One Folder;Durable poly material is TEAR PROOF AND WATER RESISTANT,Made of high quality PP plastic,Recyclable polypropylene material. Plastic Envelopes Folders AN OFFICE NECESSITY : Ideal For Securely Carrying Plenty of Important Documents in One Folder. 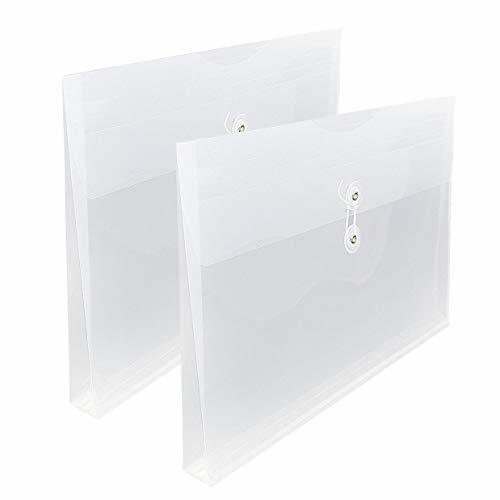 MOST APPLICABLE SIZE 12.8 x 9.3 clear document envelope, suit for A4 size paper, the most applicable size in school, office and daily life. 5 pcs per pack. Document Poly Envelope PROTECTING IMPORTANT DOCUMENT Tear, wear, moisture resistant. A few years later clear document folder, it is still sturdy and functional. 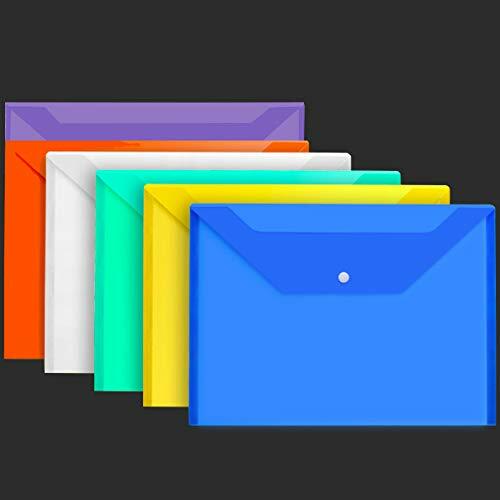 Plastic Envelopes MATERIAL : Made of high quality PP plastic,Recyclable polypropylene material. RELIABLE QUALITY Clear Plastic Envelopes Folders Industry Leading 30 Days Money-back and 12 Month Worry-free Warranty. WITH VALID TRACKING NUMBER. We apologize for the picture display of A5 size Zipper Envelope Pouch due to the system error. You can refer to the picture display of A4 and B4 size, they are the same product but different size.Thanks for your understanding. We apologize for the picture display due to the system error. You can refer to the pictures of A4 and B4 size, they are the same product but different size. Standard Paper File Bags - Filing bag sized approx. 9.4 x 6.9, suitable for the size of the A5 file.Can be safe and convenient storage Office Document, Term Papers, Newspapers, Business Receipts, Magazines, Memo, Art Kits, Drug Medication Prescription. Great portable file bag organizer at home,park,school,train travel and wherever you need! H&G Master file folders are perfect to organize your important papers, memos, projects, presentations, photos, letters, tax documents, monthly bills, or school assignments and forms at home, in the office, school, or on the go with these useful envelope folders. Main Features: 1. Easily pulls apart document folder, 100% securing, while flap&water proof . 2. and non-toxic envelope folders, durable and sturdy long use cycle poly envelopes . 3. 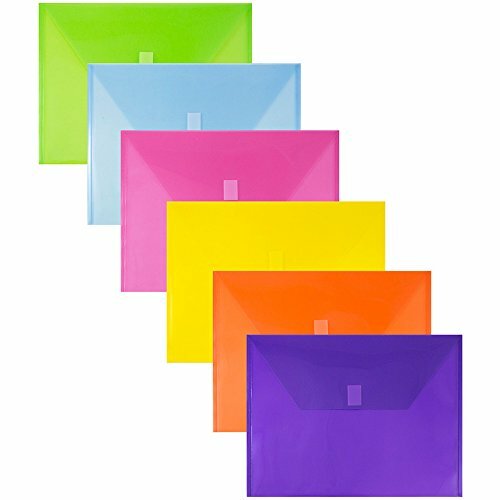 Letter size plastic color office envelopes, fits 100PCS A4 paper . 4. Lightweight easy to carry, plastic folders with flexible and tear resistant materials. 5. Translucent design easy to find your file . 6. Acid-free, archival quality envelopes are perfect for long term storage. 7. Anti - wear, tear, and moisture resistant . We promise to respond your questions in 10 hours, and full refund available within 3 months. Our file folder is no risk for you, please just go ahead! 1. 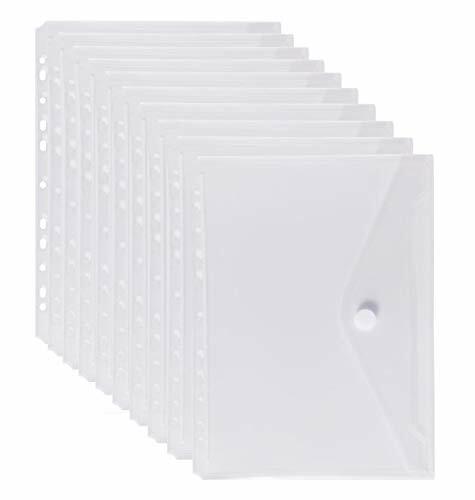 12 pack poly envelope folders with snap button closure to organize important papers, memos, projects, presentations, photos, letters, and forms at home, office, school, or on the go. 2. Made of water proof, and non-toxic durable and sturdy Long use cycle PP plastic(0. 16mm thickness), perfect for long term storage. 3. Translucent design paper organizer, easy to find your file. Secure your file safely while easy to open and take out paper conveniently. 4. 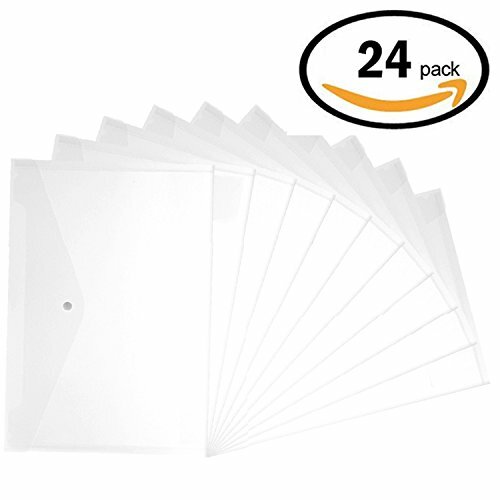 Lightweight file folders(24g/unit) easy to carry, anti - wear, tear, and moisture resistant. 5. Fits for 100PCS A4 paper per unit. We promise to reply your questions within 10 hours, and 100% refund within 6 months. This is a perfect set of folders for you. Package contains 20 pieces of high quality waterproof Velcro Closure Folders, A4 size. *Each plastic folders has a label pocket, you can do tip notes to classify and identify your documents. *Velcro closure make your document folder conveniently opening and securing contents. *Transparent folders make you can see contents without opening folders. *Premium durable PVC material perfect for long term storage. *Easy storage to keep your items organized and help you sort the clutter. No more loose papers to worry about. 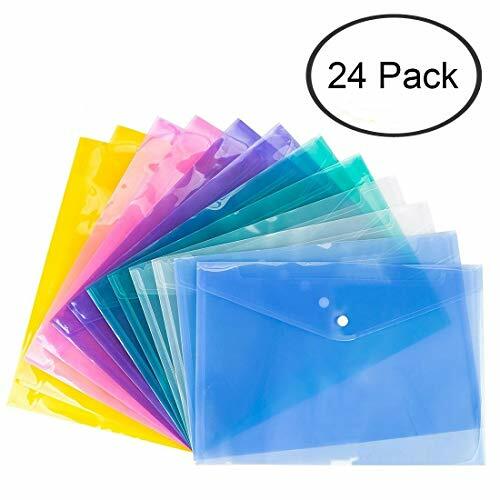 Package Including & Size: 25 Pack Blue+Yellow+Red+Green+White Transparent each color with 5 pieces Poly Envelopes; US Letter / A4 Size: 13.25 x 9.25 inch. With Snap Button & Label Pocket: The snap button make your document folder is easily open and close, improve the efficiency of organizing the files. The label pocket make your documents is easily to distinguish and find, you can mark your document folder to let you can quickly find the files that you want. Greatly improve your work efficiency and document collection efficiency, save your time to find documents! 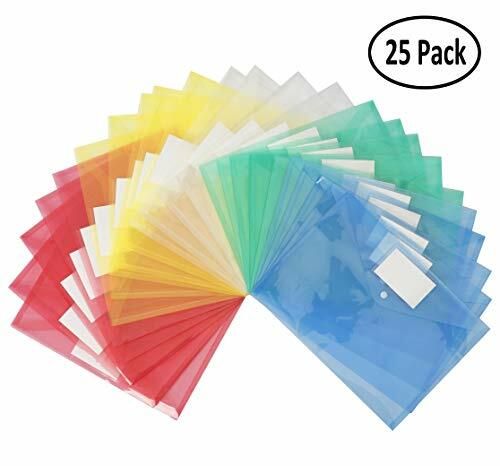 High Quality: Plastic envelope folder made with premium durable PVC material, eco-friendly, non-toxic and no smell, and wear, tear, and moisture resistant, let you can use it safely. Acid-free, archival quality envelopes are perfect for long term storage of important documents. 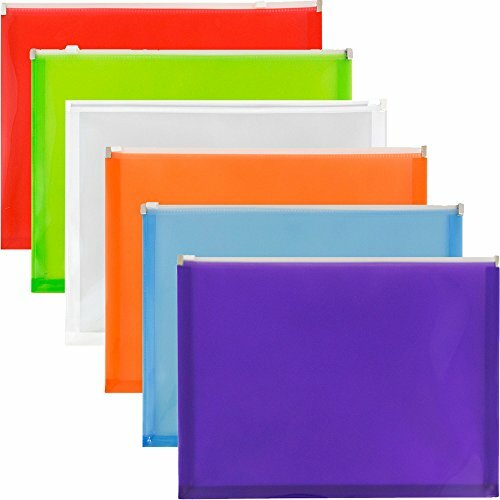 Colorful & Translucent Document Pouches: 5 colors make the poly envelope used more widely, and help you easier to organize your items. And the translucent document folder keeps contents visible and makes finding documents so easy without opening your envelopes. Professional Poly Envelope for Storage: Very durable and portable folder enough for you to carry it with you anywhere while keeping everything intact. Can be perfectly used at school, home, work, office travel and business trip etc.. Outer mini label pocket helps classify, identify and organization your document. This transparent string envelope is made of high grade PVC material with a convenient twisted string buckle. It is popular by teachers and office worker for organizing and storing important documents and notes. Feature: Flexible, wear-resistant, waterproof, safety and practical. PACKING: 5pcs string-tie closure envelopes, Single tab for effective sorting. Color: white, blue, yellow, red, green. LETTER SIZE: 13x10x1inch(33x25x3cm), keep well all documents, files organized and protected. MATERIAL: Made of high-quality plastic and it is good for waterproof, tear resistant and keeping clean. The transparent color makes your content visible and it is convenience to use and take the files you need accurately. DESIGN: The expandable gusset can be expanded to 1 inches max for large capacity and can be accommodated up to 200 paper sheets. The side-loading string-tie closure is safe to custody and organize important documents. USAGE: Great for use at the office, home or classroom. Perfectly organize and storage receipts, photos and important document. 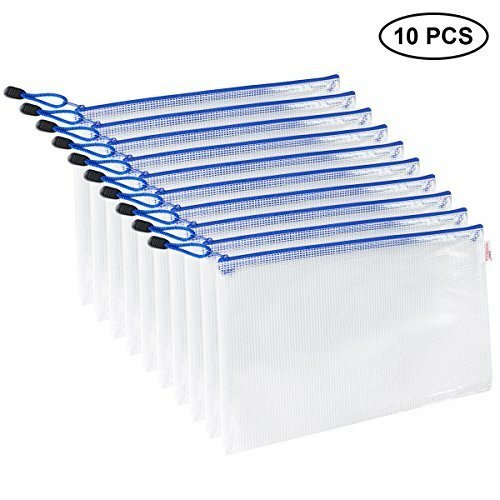 10 pieces in 5 colors A4 zipper file bags, waterproof PVC pouch plastic zip document filing folders. Buy them to make your school or office filing more simple and efficient! FEATURES: Material: Water-resistant PVC Fit Paper Size: A4 and size under A4 Color: Yellow, Red, Blue, Green, White Package includes: 10pcs File Bag Dimension: 12.6''x 9''(L*W) Opening Type: Zipper NOTES: Waterproof refers the plastic surface, not the zipper part. If you put the whole bag into water, the water will get into the bagfrom the zipper and the sewing needle eyes. Keep away from children to avoid suffocation. Come with 10 pieces in 5 Colors: blue, red, white, yellow, green, 2 pieces for each color. Size: 12.75 inches (32.5 cm) in length and 9.25 inches (23.5 cm) in width, fits for A4 paper files, and size under A4. Lightweight, each bag only weighs 32g / 1.1 oz. Made of High-quality environmental water-resistant PVC material and smooth zipper. Square-grid fiber layer in between makes these file bags durable and feature-safe. Moderate transparency design help you to locate documents easily. School and office storage will be simple, you can organize files accurately and efficiently. For a full customer service support, please do remember to buy with MILEKE instead of other resellers! 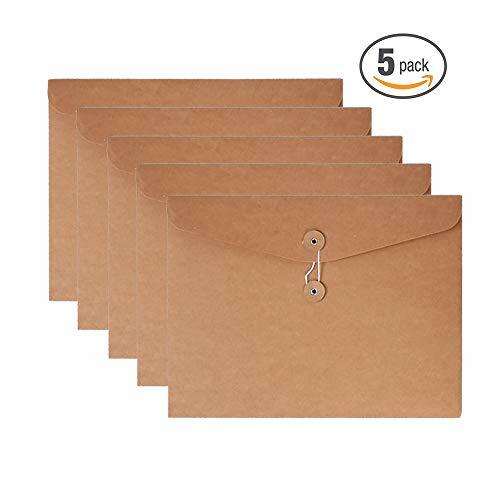 This kraft paper string envelope is made of high grade kraft paper, thick and durable. String tie closure for opening and securing contents conveniently. It is a good choice to students, teachers and office worker for organizing and storing important receipts and notes. Application: suitable for your creative projects, such as conference negotiation, examination venue, event, consultation. If you love Kraft things, don't hesitate, they would be your best choice. Package included: 10 pcs A5 kraft envelopes, 6.9 inch x 9.3 inch / 175mm x 238mm, keep well all bills, receipts organized and protected. Material: Made of high quality kraft paper, thick and durable. It is anti-slip and not easy to be ripped, can be reused several times. Design: Side loading with string tie and nontransparent design is very convenient for opening, closing and securing contents. Color: Three. Brown/black/white. You can on them with a color paint marker. Application: Good for storage all kinds of files, letters, receipts, bills, invoices and more. Package included: 5pcs string-tie closure envelopes, Single tab for effective sorting. Color: white, blue, yellow, red, green. Legal Size: 14x10 inch(36x26 cm), keep well all documents, files organized and protected. Usage: Great for use at the office, home or classroom. Perfectly storage receipts, photos and important document. VANRA desk string file holder organizer is a nice tool to organize your documents, files, bills, contracts, mails, catalogs, scrapbooking, painting works, receipts, manuals, letters, papers, vouchers, cards like never before. Keep items organized while looking great at the same time. Durable and reinforced kraft material keeps papers and documents from slipping out. Also for and secure and long-lasting strength. 100% SATISFACTION GUARANTEE - Love it or your money back! If you have any problem or suggestion, please feel free to contact us first, we provide friendly, easy-to-reach support for you. Buy with confidence! 12 months warranty - free exchange. The A4 file folder organiser is perfect for daily filing and storing important documents. Fits both A4 paper size and letter size. 5-pack of string-tie closure envelopes help manage forms, records, and other important documents. A useful addition to any well organized home, mailroom or office. Letter-size business envelopes keep your workplace organized and tidy. Durable kraft filing envelopes are made of high strength kraft which is environmental friendly and nontoxic. Simple string tie closure keep documents secure. Reinforced straight-cut single tab for effective sorting. The side-loading project document holder provides a slim profile, slipping smoothly into any coordinating filing system. File fits nicely into a file cabinet for long-term storage. Filling storage is perfect for home, office, school, business use. Approximate Dimensions: 12.2L x 9.2H. 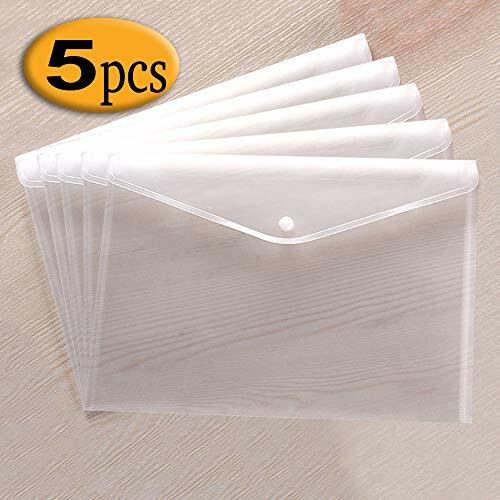 Package includes: 5 pcs string envelope pockets. 100% SATISFACTION GUARANTEE - Buy with confidence! 12 months warranty-free exchange. Flexible, wear-resistant, waterproof, safety and practical. 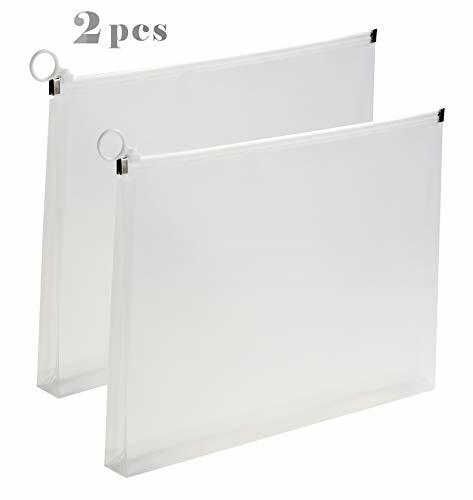 Package included: 2pcs transparent envelopes, clear finish for easily locating documents. Legal Size: 14x10 inch(36x26 cm), keep well all size documents, files organized and protected. Material: Made of high-quality plastic and it is good for waterproof, tear resistant and keeping clean. It is convenience to use and take the files you need accurately. Design: The side-loading string-tie closure is safe to custody and organize important documents. The expandable gusset can be expanded to 1 inches max for large capacity and can be accommodated up to 200 paper sheets. Usage: Perfectly storage paper, receipts, photos and important document. Great for use at the office, classroom or home. Our zippered products make organizing easier, filing faster, and information more accessible. 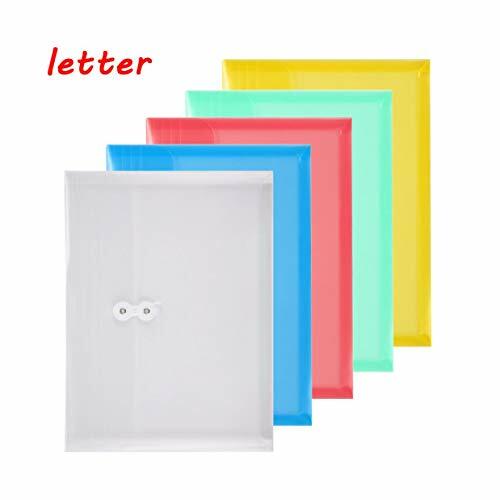 The clear and sturdy plastic envelopes provide easy access to contents within and expand up to 1.18 inch to hold a large amount of documents paper, up to 300 sheets. Built to last, sturdy and smooth to the touch, our zip pouches are ready to perform at its best. It is definitely a great storage solution for home, office, travel or school.  IF YOU HAVE ANY QUESTION PLEASE CONTACT US, WE WILL DO OUR BEST TO SERVE YOU. 李 Measurement: 9.84 x 13 x 1.18 (25 x 33 x 3cm), perfect for holding 8-1/2 x 11letter paper. 李 Translucent archival quality folder case provides visibility and document protection. 李 The folder is made from premium plastic, features tear-resistant, durable and waterproof. 李 Gusset expands 1.18 for additional capacity of up to 300 sheets. Great for office document, manuals, worksheet, receipts, paperwork, important files and more.